Fela Kuti was a pioneer in Afrobeat and huge influence on my African taste in music. Afrobeat is a combination of funk, jazz, Nigerian high-life, and rock. Afrobeat tends to be played by big bands with a complete rhythm section, horn section, guitar, bass, vocalists and also dancers. This leads to a very full sound with a strong rhythmic groove throughout that has a funky world beat feel to it. Besides his great ability to play and compose music Fela Kuti was also very outspoken on his political views both in his music and in the real world. Since he was before my time and since I have no connection to Nigeria I have always cared more for his music than for his political views. That being said I still respect the man for voicing his opinion and standing up for them. Fela would sing some of his songs in Yaroba but he would also sing them in pidgin English to try to make his music accessible to all of Africa and not just his native Nigeria. He died at the age of 58 from complications of his health due to AIDS. Fela Kuti had a huge influence in Africa and abroad and this was demonstrated when more than one million people attended his funeral. A lot of Fela Kuti’s music also has a political edge to it, but at the same time it would also have an infectious dance groove to it. This allowed him to gather large groups of people to enjoy his music and dance while at the same time he could also get his political message across. One of his more famous songs “Zombie”, from the same titled album, is a critique on the behavior of the Nigerian military is a great demonstration of his political music. This album/song enraged the military and resulted in the destruction of his commune and the death of his mother. This album is considered by many critics to be his best release and it definitely is a good release and worth checking out. I like Fela’s playing and composition but what I really love about his band is the awesome rhythms that his great drummer, Tony Allen, comes up with to drive the songs and keep them moving. One of my favorite albums of his to listen to for rhythmic inspiration is Live! (with Ginger Baker). Not only is this a great sounding live recording of Kuti’s music but it has the added bonus of having both Ginger Baker and Tony Allen on the drumsets. This was recorded just a few years after Ginger Baker left Cream and the man is still in top form. Ginger Baker’s jazz tendencies mixed with his ability to hold a solid groove fit in perfectly with Kuti’s music. There are some vocals on the songs but not nearly as much as on his later albums. The main focus is definitely the music here. The first time I heard this album I would have had a hard time identifying Baker’s playing since the music is definitely more Afrobeat than Cream. After I became more familiar with Fela Kuti’s work Ginger Baker’s presence is easier to identify. He adds a strong rock feel mixed with some great jazzy drum rolls and fills. The album was re-released in the 80’s and they added a bonus track that is 16 minutes of Tony Allen and Ginger Baker dueling on drums at the 1978 Berlin Jazz Festival. It has got a lot of strong tom beats and grooves throughout it and is a bit more typical of what I think of when I think of Ginger Baker. There isn’t a bad track on this album but “Ye ye de smell” really shows off the drumming talents of Ginger Baker and Tony Allen. Fela Kuti was a huge influence on introducing African music to me and I still use him as reference point when listening to any other music from that great continent. Two of his sons, Femi and Seun, each have their own Afrobeat bands and are following in their father’s musical footsteps. Both of these bands are worth checking out especially since there is no longer the opportunity to see Fela anymore. Tony Allen is still alive and well and continues to play and expand Afrobeat music in his own band. If you want solid, hard-hitting, groove-based African music then check out Fela Kuti especially Zombie and Live! (with Ginger Baker). 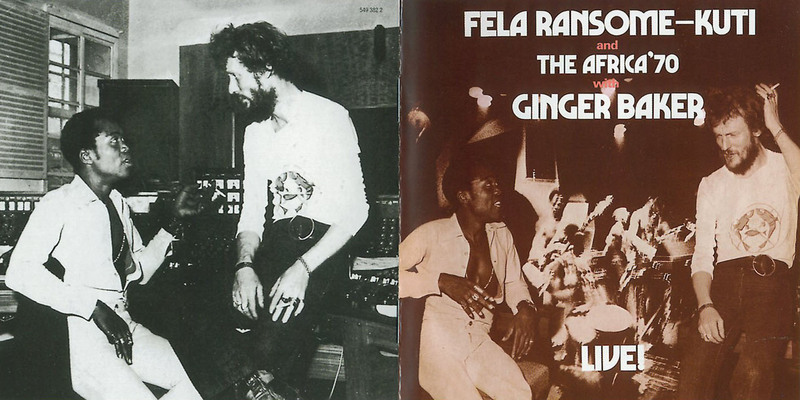 Besides this album with Fela, Ginger Baker also played with him on Baker’s album Stratovarious.